Synopsis: Information seeking is a fundamental human activity. In the modern world, it is frequently conducted through interactions with search systems. The retrieval and comprehension of information returned by these systems is a key part of decision making and action in a broad range of settings. Advances in data availability coupled with new interaction paradigms, and mobile and cloud computing capabilities, have created a broad range of new opportunities for information access and use. 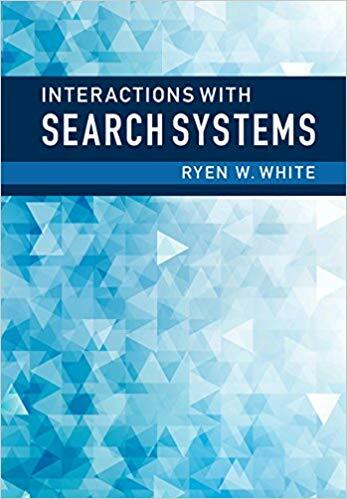 In this comprehensive book for professionals, researchers, and students involved in search system design and evaluation, search expert Ryen White discusses how search systems can capitalize on new capabilities and how next-generation systems must support higher order search activities such as task completion, learning, and decision making. He outlines the implications of these changes for the evolution of search evaluation, as well as challenges that extend beyond search systems in areas such as privacy and societal benefit. Published by Cambridge University Press (CUP) in 2016 (More information). The PDF of a near final version of the book is now available for download. The file is password protected at the publisher's request. The password is iwss2016. APA: White, R.W. (2016). Interactions with search systems. Cambridge University Press, New York. Buy the book from Amazon or direct from CUP.